Armor coated, waterproof, camouflage and producing 150 lumens with a 130 yard range, Browning's Chaos Tactical Hunting Flashlight lets you rest assured that when you need light it will be there. On demand, in any conditions. 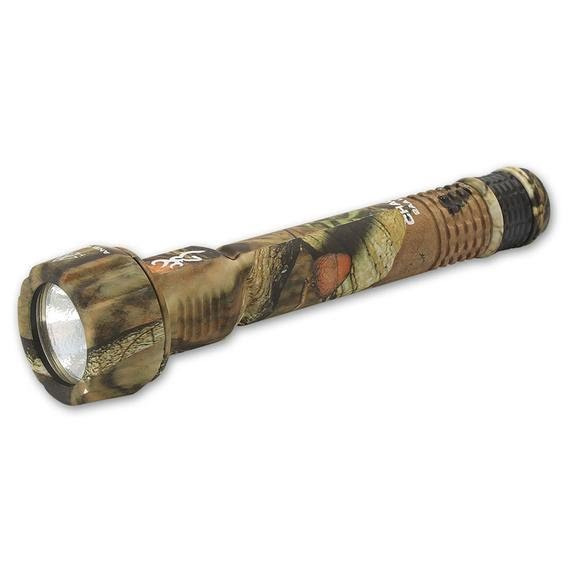 Armor coated, waterproof, camouflage and producing 150 lumens with a 130 yard range, Browning&apos;s Chaos Tactical Hunting Flashlight lets you rest assured that when you need light it will be there. On demand, in any conditions. Cree XP-E LED emits a clean, white light. Uses two AA alkaline batteries (included). High, low and fast strobe output settings. Waterproof: Submersible to three feet for 30 minutes. Aircraft grade aluminum construction with unbreakable lens. Mossy Oak Break-Up Infinity camo.